Whether he was inspired by Ikea, or simply wanted to one-up the Swedish furniture giant, Gustav Düsing's flat-pack Chair 23D is a masterpiece. It requires a sheet of plywood and supreme skill with a router. And thanks to its interlocking one-time-assembly design, there's no risk of it collapsing when you slump into it. 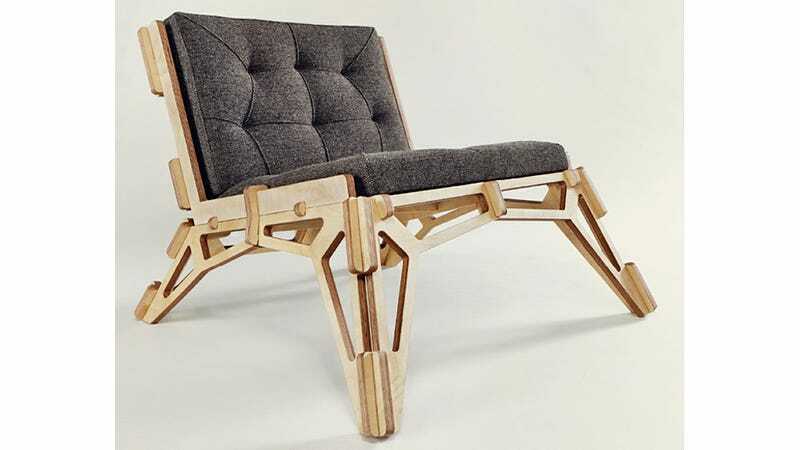 The use of birch veneer plywood gives the lovely seat a look that's industrial, but polished. And its engineering is based on the natural form of the human skeleton, complete with rib-like branches coming off a central backbone support, and splayed legs that distribute the load through strategically placed trusses. There's no word on if or when Gustav plans to put the 23D into production. But when it does, the shipping and materials costs should be relatively cheap, even if the chair itself costs a small fortune.